Sumavision has over 15 years experience in video security industry. StreamGuard system can provide powerful video security services in multiple networks for different operators. • StreamGuard CAS：Traditional CAS system with modular design can be used for SD, HD and UHD digital TV programs in DVB-S/S2, DVB-C and DVB-T/T2 digital TV broadcasting networks with the streaming media services and data broadcasting functions. • StreamGuard DCAS: It includes not only CAS functions, but also enhances the terminal with high security chipset and cardless solution, achieves the CAS app OTA downloading and replacing. • StreamGuard DRM: With mulitple type of multimedia resources. StreamGuard DRM can provides effective and flexible security control with China DRM standard. It can fully covers Live and VOD services for OTT/IPTV/VOD systems with security control for all terminal types to enlarge the profits of copyright owners. 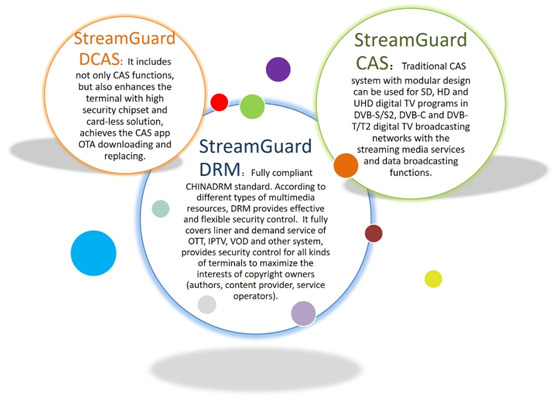 StreamGuard can not only meet the DTV operation needs, but also apply to the content protection requirements for emerging video content providers in Intranet As or Internet.As well as it can provide security protection for industry customers, such as hotels, schools, enterprises, hospitals and others. The security protection covers SD, HD, even 4K programs. In domestic market, products cover 28 million user level operators. For overseas market the deployment is more than 100 operators over 30 countries. It can achieve all operation requirements under unidirectional network and two-way network. It has comprehensive functions. Besides common functions, it also includes advanced fingerprint, head-end watermark, conditional broadcast, emergency broadcast and other customized functions. Smart card adopts EAL5+ certificated chipset, terminal adopts high security chipset with OTP and TEE. At the same time, terminal is requiredto have SVP and HDCP support to meet the security requirements of Hollywood for 4K program. 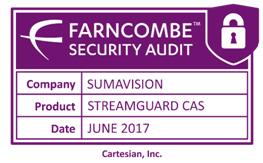 The headend uses Sumavision self-developed hardware encryption technology and the system has passed third party security audit. Customized product services, from a number of aspects of security, stability, operation and maintenance to help operators to improve their own value.